Black Velvet Apricot might sound like something you would see under the dessert section on the menu of a Michelin star restaurant, but it is in fact the name of the new sumptuous selection from The Body Shop. The new range includes lip balm, bath nectar, a reed diffuser, body butter, body smoother and shimmer lotion. Not perhaps items to be used in your everyday beauty routine, but products to be used for an indulgent pamper session. It goes without saying that the aroma of Black Velvet Apricot is good enough to eat, but there is something extra special and sophisticated about this collection. You are seriously going to want to smother your entire body in this scent and not wash until the next time you use it. It really is that scrumptious. For a perfect night of preening and pampering start by using ether the reed diffuser or the scented candle to create a relaxing ambience whilst having a bath. Once you have splashed around for a while it’s time to lather up using ether the shower nectar or body smoother, both which leave your skin soft and silky to touch. Finish off with ether the body butter or shimmer lotion, depending on what mood you’re in. As ever, The Body Shop has priced the collection reasonably and the packaging is divine. Black Velvet Apricot would make a lovely gift for a birthday or Christmas present, or you could just buy it as a gift to yourself. After all we all need a little treat now and then! 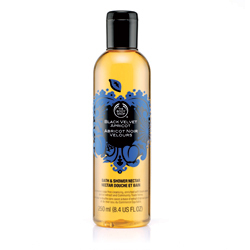 The Body Shop online is currently offering 20% off when joining their love your body incentive until the 30th September.